You guys are total rockstars. I had to upgrade my account in order to see all the responses to my survey! Thank you, thank you! If you haven't filled it out, you still can! It's super short and anonymous. Click here. Good karma will totally come back around to you. 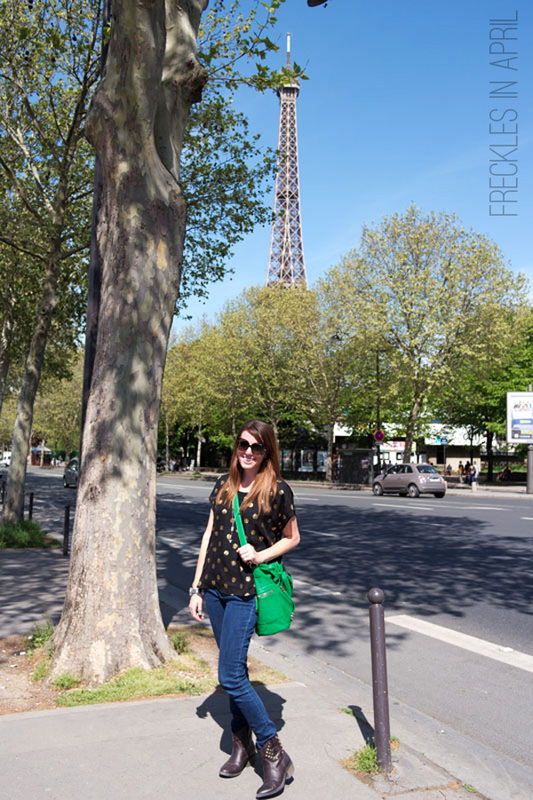 I had my Paris packing all sorted out weeks before our trip. 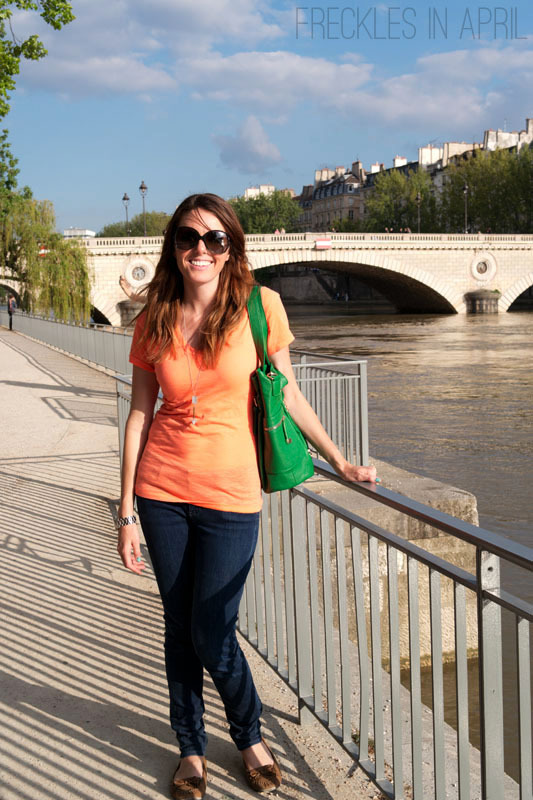 I had looked up the average weather in Paris in May, washed and ironed my pieces, picked out jewelry and shoes, and made sure it all fit in my suitcase. Everything was hanging neatly in my closet ready to go. Then, about a week before our trip, my sister texted me- "Have you looked at the extended forecast? It's going to be cold! And rainy!" And so, a few days before we were set to leave, I completely revamped my packing for colder and wetter weather (low 40s at night, 50s to low 60s during the day). It was annoying and a little stressful but I managed. And THEN, the day before we left, the forecast was warming into the high 60s and low 70s during the day. Still 40s at night. Also, less rain. The day before we left I revamped again. By the time I had repacked my suitcase for the millionth time I was POSITIVE I was forgetting something really important. Like...underwear. Or a jacket. I think the moral of the story is: don't plan ahead. I am pretty darn good at packing light. This shirt was a last minute score a couple days before we left. I knew I'd be sleeping on the plane and wanted something warm and cozy (two adjectives my closet generally lacks) and wrinkle resistant. It was perfect! I apologize for what you're about to read: An unexpected perk of the loose fit meant it was nowhere near my armpits. We left home at 5am on Thursday morning and landed in Paris at about 8am Friday morning. All we wanted was to take showers and freshen up but, alas, our hotel room wouldn't be ready until Friday afternoon. We were pretty much stuck in the clothes we flew in. I wore that shirt for like 48 hours straight and it still smelled fresh as a daisy when I finally took it off. I had myself a good pat on the back over that. Come along, shirt, let's go to the Arc de Triomphe. Later that afternoon (you can probably figure out where this is). Top from Macy's, undershirt from DEB, bag from Charming Charlie, necklace from American Eagle, same jeans, boots, and watch as above. 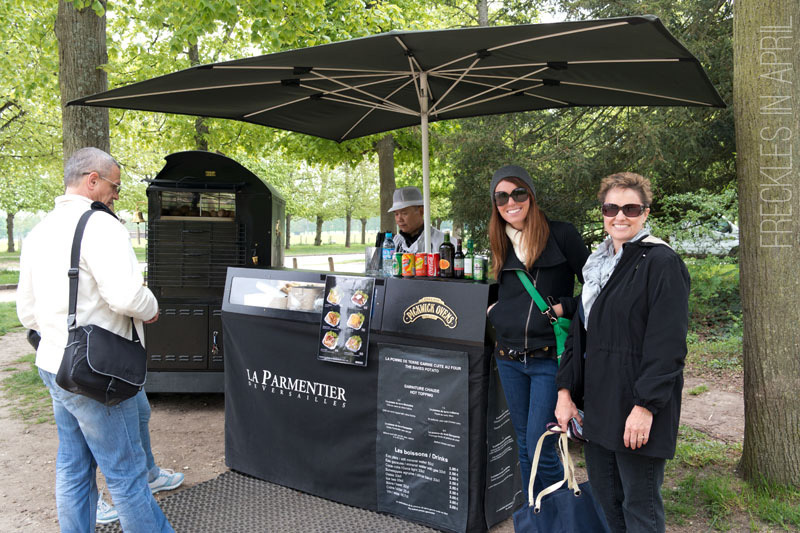 The morning at Versailles was COLD. Probably the coldest we saw. This shirt is a two layer deal so it gave me a little more warmth. It didn't match my shoes awesomely but, eh. See: last minute packing panic and me deciding not to worry about it. 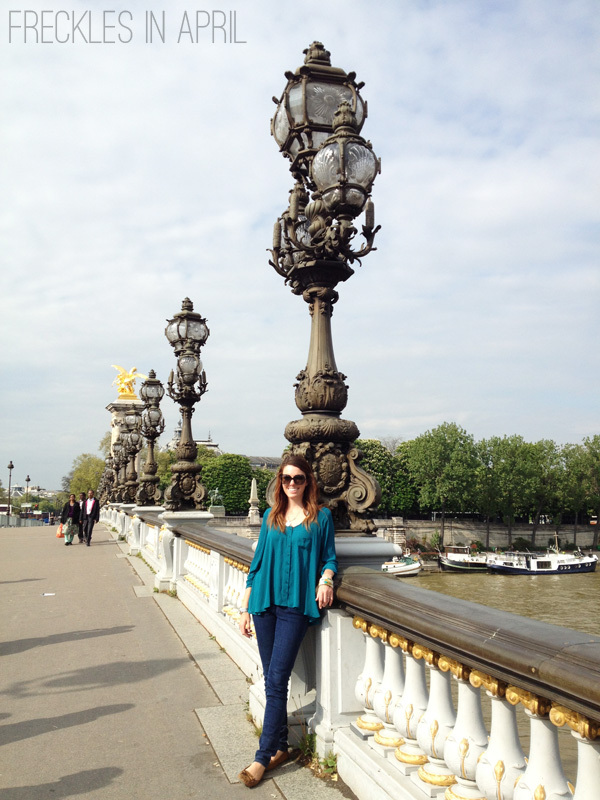 Minus my jacket it was great for a mercifully warmer walk along the Seine. Shirt from Macy's (I think? ), Moccs from Payless, Jeans, jewelry and bag have all been mentioned above. That's right. 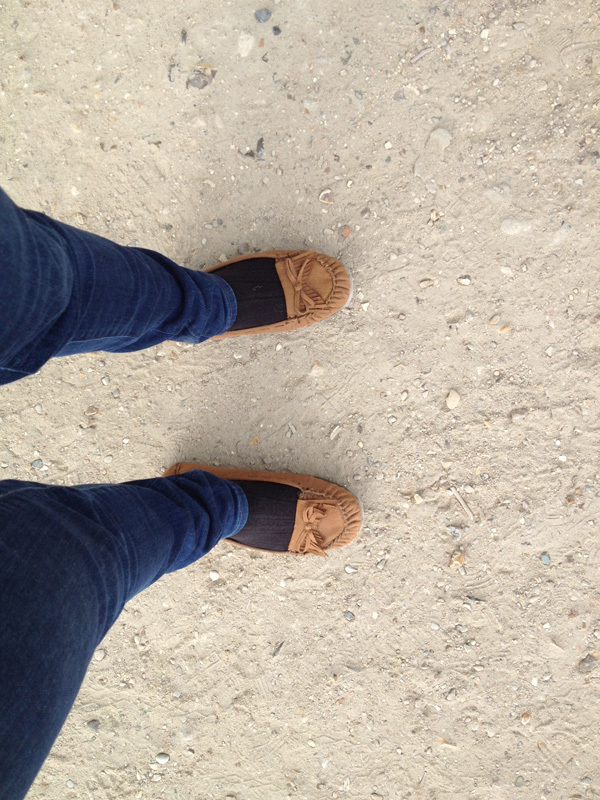 Socks and moccs. After two days in my boots (three, if you count the travel day) I desperately needed a change of shoe scenery (our feet were dead by the end of each day. DEAD, I tell you.) and it was really cold that morning and...this happened. I took them off as soon as it was warm enough, but I apologize to the people of France. I definitely wore them to the top of the Eiffel Tower. Tourist Shame be upon me! Shirt from...Macy's? Bangles were a birthday gift from my seeester. Everything else has been mentioned above. This shirt photographs horribly but I love it. It's a nice color and a comfortable fit. Excepting one awkward moment involving a strong breeze at the metro station, it was a good choice. Plus, it matched my new birthday bangles (thanks, Nikki!!). Anyway, then I hopped back into my first outfit (not smelly!) and flew home. And, because a few (brave? misguided?) people asked for pictures I'm devoting this whole week to my trip. If you're not interested in travelogues, go ahead and just mark my posts as read for the rest of the week and come back next week for my regular stuff. If you ARE interested in a lot of pictures of me making stupid faces in a foreign country, you're in luck! I have lots of those. A handful of normal faced pictures as well. And some scenery and a few pastries. 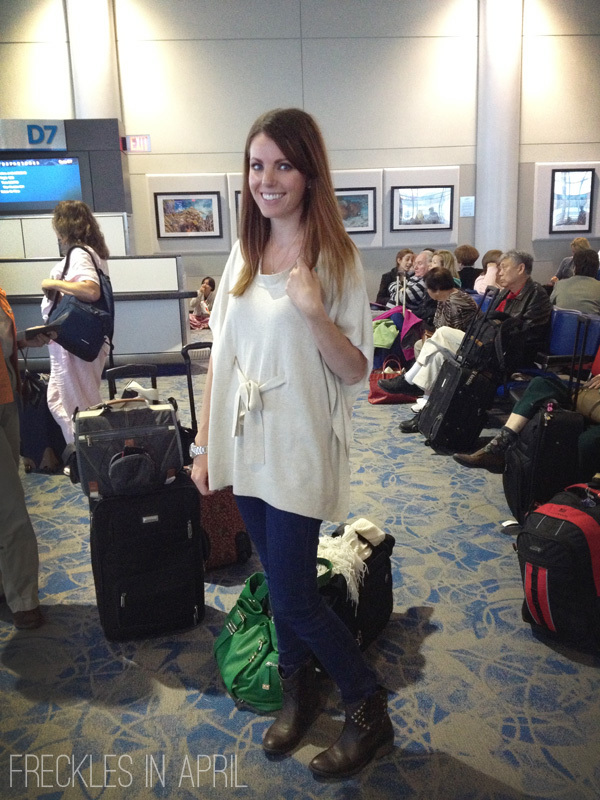 Awesome tips on packing light -- oh, sounds wonderful - ready to pack my bags! Sounds amazing, and you looked super cute & comfy while traveling abroad. 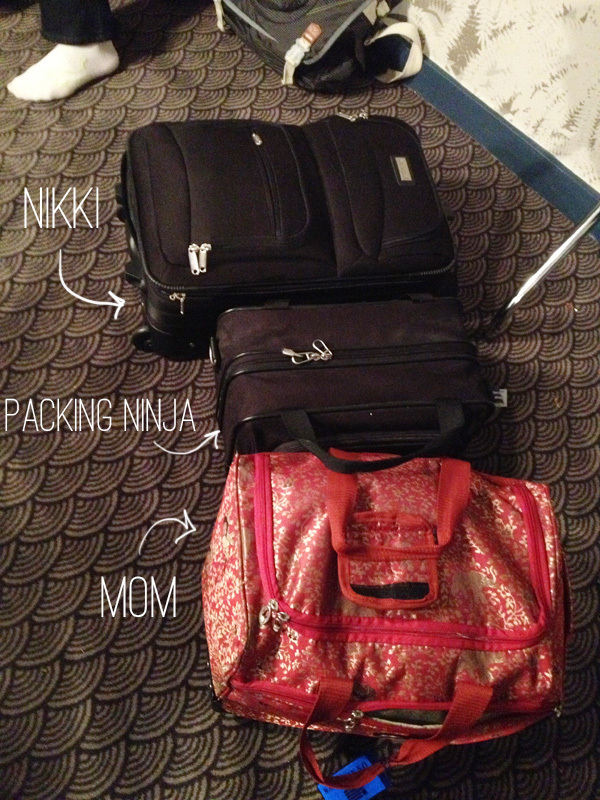 And yay for being a packing ninja! My husband is one as well and it's quite the handy skill. I'm already looking forward to more Paris pictures - bring them on! Love the bag, amazed at your suitcase, horrified by the socks, and of course, adore the outfits. The shirts in particular are my favorite, as they go perfectly with the loose-top trend I'm obsessed with. Your green bag is so cute! Where's it from?